Children become connected to the digital realm at an increasingly younger age (via MySecuritySign.com). Stanley Arnold, a man who once ran for president in the 1970s, said: “Every problem contains within itself the seeds of its own solution.” Although his campaign ultimately fell flat, his point resonates beyond the 20th century. The proliferation of online bullying, in particular via social networks, is garnering serious attention, and requiring equally powerful responses. Researchers and advocates alike stress the importance of focusing on not just victims of bullying. Cyberbullying campaigns must also inspire the 88% of teens who admit to standing by when witnessing cruelty to have the conscience to take a stand. Acknowledging the emotional cost of cyberbullying helps people be as tactful online as they would in person (via MySecuritySign.com). 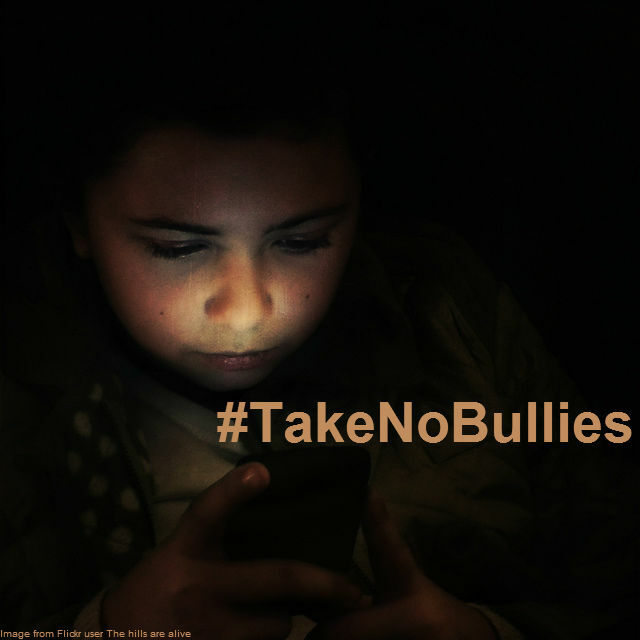 At SmartSign.com, we used our resources as a sign and label company to create #TakeNoBullies, a campaign that promotes kindness and sheds light on the pain that a belittling tweet, status update, or photo upload can inflict upon a victim. #TakeNoBullies uses stickers and social network specific messages to promote digital responsibility. Ranging from Facebook, Twitter, Instagram, Pinterest, Tumblr and Google+, the stickers communicate positive, catchy messages. Respecting others is the simplest and most important step in stopping bullying (via MySecuritySign.com). Digital citizenship is a new and useful phrase, referring to the sensible use of the internet and mobile devices. The conversation of how to groom responsible digital citizens has become a pressing topic, since our society has collectively witnessed how online bullying drives victims to depression, and in some cases, suicide. Traditional anti-bullying messages, such as ones schools use to prevent bullying behavior in classrooms and playgrounds, no longer apply to the way that people now instantly and distantly communicate. So, it’s time to deliver a message that’s relevant, memorable, and makes a difference.